Hi friends!“Rava Kesari” is a popular sweet in the south Indian states especially Tamil Nadu and Karnataka. It is easy to prepare and the ingredients are easily available. 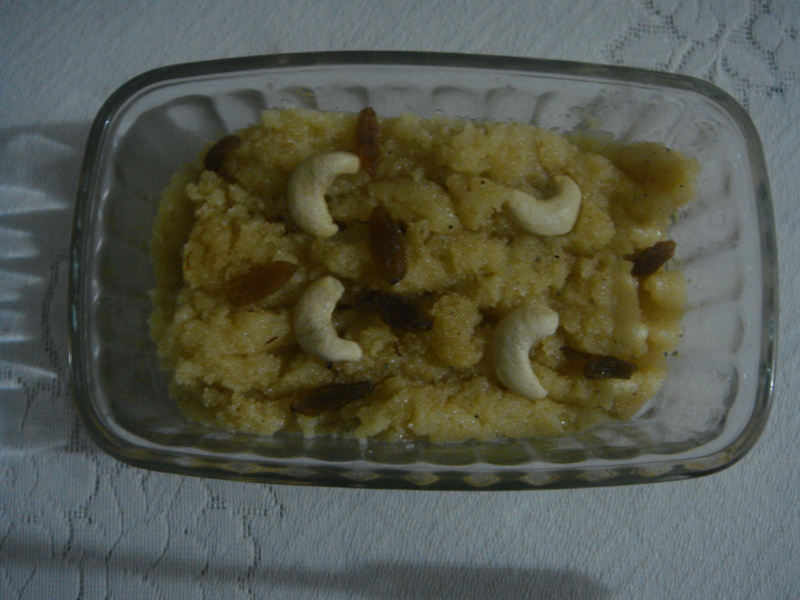 Rava kesari is made with semolina, it’s North Indian counterpart is sooji ka halwa. Cooking Time : 20 minutes. Heat one tbsp ghee in a frying pan/ kadai/ wok and fry lightly cashew, Kishmish, cinnamon, cardamom and keep aside. In a mortar-pestle crush the cardamom seeds to a fine powder and keep aside. In a frying pan/ kadai/ wok take four tbsp ghee, on medium flame add suji/ rava/semolina and fry till the lovely aroma of fried rava comes . Reduce the heat to low flame. Slowly add the boiled milk -water mix to the fried suji/ rava/semolina, stirring continuously. Add dry fruit mix, alongside, add sugar, cardamom powder to it, stir well till it thickens and sets.The suji/ rava/semolina will absorb the water and the mixture will start thickening. Keep adding a few teaspoons of ghee in the suji/ rava/semolina mix and keep on stirring till the whole mixture starts thickening and starts to leave the sides of the kadai or pan. Switch off the heat. Serve Rava kesari hot . *Take all the ingredients in the above mentioned quantity only. *Do not refrigerate the rava kesari while it is hot, allow it to cool down to room temperature. *While adding ghee, keep on stirring well otherwise rava kesari prepared will not be uniformly solid. * You can add sugar equal to the amount of rava for more sweet or 3/4 cup or half of the sugar if less sweet rava kesri is required. *Adding more or less ghee is individual choice, at the same time don’t forget to roast Rava using ghee.